On Friday morning the Roanoke, Virginia television station WDBJ marked the one-year anniversary of Alison Parker and Adam Ward's deaths with a moment of silence on the air. There are off-air tributes at the station as well. WDBJ is a changed newsroom after the televised ambush by an ex-employee that left Parker and Ward dead on August 26, 2015. Ward was operating the camera and Parker was in the middle of a live report at a local tourism destination, Smith Mountain Lake, when the gunman approached. Both journalists were killed at point blank range. 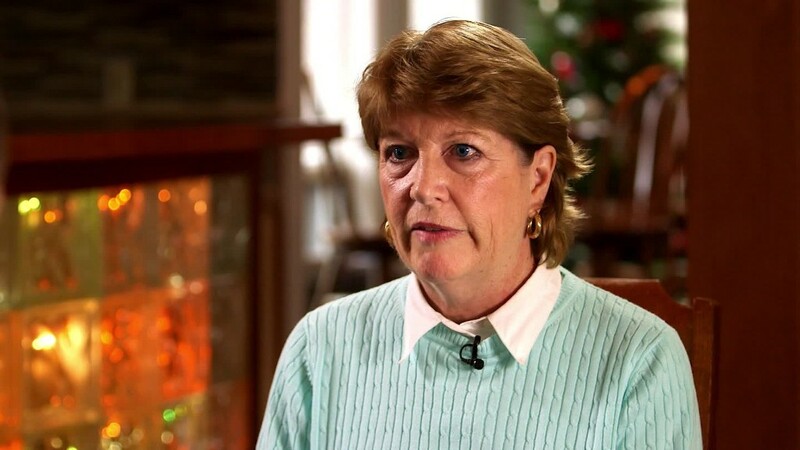 The tourism official Parker was interviewing, Vicki Gardner, survived, but was seriously injured. The attack represented the first deaths of journalists on assignment in the United States in almost a decade. One year later, the station is under new management. The news director and general manager who steered the newsroom through the crisis now have new jobs. But Parker's boyfriend Chris Hurst, who anchors the 6 and 11 p.m. news, remains at the anchor desk. He is off work this week because he and some of Parker's family members and close friends are on a week-long rafting and hiking trip in North Carolina. "This is where she came every year for her birthday," Hurst said by phone on Thursday. A rafting trip on the Nantahala River in North Carolina was one of Hurst's last memories with Parker before the shooting. He said he expected Friday to be a "very difficult day because it reminds us of how she died and how utterly inhumane it was." Hurst described what happened to Parker and Ward as "workplace violence," not necessarily related to their occupation in the news industry. That said, the gunman did exploit the inherent vulnerabilities of a TV live shot. He approached Ward from behind, according to the body camera video that he published on the web before killing himself. In the immediate aftermath of the shooting, local TV stations were concerned about copycat crimes. Some stations stepped up security for crews in the field. But there have not been systemic changes in the twelve months since the murders. Confrontations occasionally take place between television reporters and bystanders. One such incident, involving a woman sucker-punching a reporter on live TV, happened in Philadelphia two months ago. Hurst said broadcasters have a duty to "ensure the safety of their staffs out in the field." But there is only so much that can be done. Earlier this summer WDBJ suffered a round of layoffs, an all too common occurrence in the news business. Most of the ten people who exited the station were videographers and other personnel who worked behind the camera. There is increasing pressure to work as "one man bands," a term of art for journalists who set up the live shot, operate the camera and step in front of the camera to deliver the report -- jobs that used to be performed by two or three members of a team. This pressure is by no means unique to WDBJ. But it may be especially sensitive within the newsroom due to Parker and Ward's deaths. Two employees said on condition of anonymity that the "one man band" assignments are becoming more common but that news crews with multiple employees still handle some stories. The station's new general manager Matt Pumo did not respond to a request for comment. Jeff Marks, WDBJ's longtime general manager who was thrust into the national spotlight after the shootings, was prepared to retire this time last year. At the time of the shootings, a plan was in the works for WDBJ to be acquired by Gray Television, a firm that owns stations in 51 markets across the country. Marks was offered a corporate job at Gray, so he now hopscotches from station to station, but he'll be back at WDBJ for Friday's somber anniversary. In the aftermath of the attack, he said, "I think we became firm in our resolve to live up to the standards that Adam and Alison tried to reach." What he wants to impart to up-and-coming journalists now is that "this is a safe profession, as much as we're safe anywhere." Compared to some other countries, journalists are free to operate across the United States. "If we're going to have this freedom, to operate freely and to say what needs to be said, then we need to find out what needs to be said," Marks said. That's the message he said he is planning to convey at a journalism conference in September. Earlier this month WDBJ completed a memorial to Parker and Ward outside the station's entrance. "As we come up on the one-year anniversary of their deaths, we hope to respect them by living the way they did -- with kindness and laughter," the station said in a Facebook post. On the morning of the shooting, Hurst was asleep because he had worked the late-night shift the prior day. Ward's fiance Melissa Ott was in the control room producing the 6 a.m. newscast, which means she witnessed the shooting and the aftermath. It was supposed to be Ott's last day at WDBJ. She had accepted a job at a station in Charlotte, North Carolina. Ott is now working at that station, but has chosen not to speak about the shooting. "Melissa is in the business so she understands everything that talking and not talking entails. I wholly respect her decision," Hurst said. He pointed out that "she's had to make the same pitches before," meaning she has had to ask loved ones of other shooting victims for interviews. Hurst and Ott were in touch this week — they pieced together a playlist of Parker and Ward's favorite songs and artists. Q99, a local station in Roanoke, is playing the songs and dedicating Friday morning's broadcast to the two slain journalists.